With just one step, sixteen year old Alexandra Jennings's world changes, literally. Will Alex risk her entire world, and maybe even her life, to save Medora? Being the daughter of two successful archaeologists has left almost sixteen year old Alex with a sense of wonder, but also a longing for the comforts of home. So as her parents set off on their latest adventure, Alex is enrolled into the International Exchange Academy, a boarding school where she will reside for the entire school year... But the International Exchange Academy isn't what it seems. Behind the facade lies a school beyond the human realm. Akarnae is a long standing tradition, a school for the magically gifted where teens' abilities are nurtured. Unable to return home, Alex will need to make the most of her opportunities, enrolling with the assistance of Jordan and Bear, two volunteer students who plan to take Alex under their wing. But Akarnae has other plans for Alex. She's the chosen one, granted access to the inner sanctum of the school library, an ancient relic of the magical world. Alex must not only navigate a new school, a life she never knew existed and the secret that she is not of their world. Being chosen will mean fighting a darkness that Alex and Akarnae aren't prepared for. 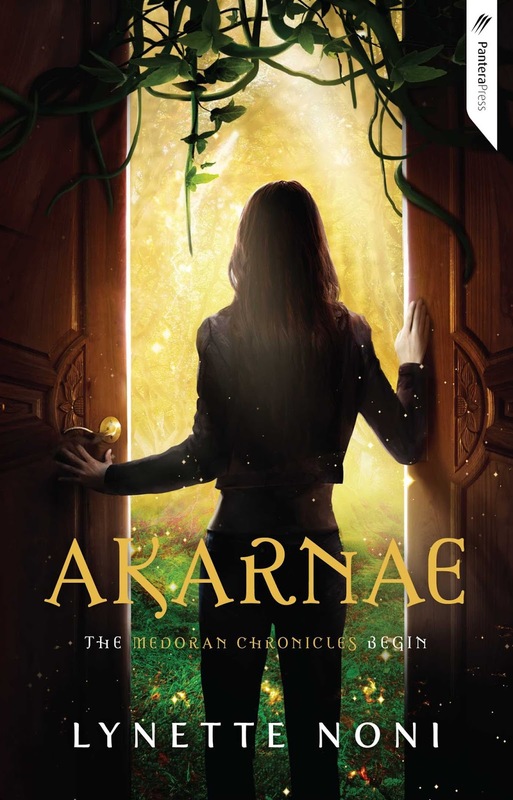 Akarnae was wonderfully written and delightfully surprising, not to mention an incredibly enchanting fantasy. Alex's story begins with her parents abandonment in favour of their own adventure, leaving her at a new school without helping her settle in. Where most teens would be an emotional disaster, Alex takes it all in her stride but before she's had a chance to enroll, she's thrown into a world that is not her own. Alex has no choice but to remain at Akarnae, with the only person who has the ability to return her to her world, now missing. Based on an age old method of sorting teens by their potential, Alex now finds herself within a multitude of advanced skill classes, including combat. With her two new friends in Jordan and Bear, Alex hides the secret of who she truly is from her peers. I loved The dynamic between Alex, Jordan and Bear. Their friendship wasn't complicated by a romance but it's undeniable that both Alex and Jordan share a connection. The two worlds of Medora which is where Akarnae is based and Freya, which is our own world where Alex was born and based were both very similar, apart from Medora being the magical plane on Earth. It made the storyline incredibly easy to follow even for non fantasy readers and kept the world building simple, making Akarnae perfect for fans who also enjoy middle grade reads. Akarnae features shades of Harry Potter, a boarding school for magically inclined teens. With strong, friendship based relationships and a chosen one based storyline where Alex's world has been turned upside down. Each student enrolled at Akarnae is there on the basis of their unique magical abilities, except Alex who has yet to discover what her ability is. My only gripe was Alex's parents and how unprepared she was for this next stage in her life, even based on her attending the supposed International Exchange Academy alone. It was well written and incredibly enchanting, but felt as though it may be more suited for a middle grade audience, where young teens can grow with each installment. The world building although lovely, fell a little flat at times and I wasn't able to grasp a sense of what Alex was experiencing around her. The renowned school library was magnificent. I loved the Wonderland type feel of the enchanted rooms and the history behind the building. Akarnae was a wonderfully written, a mild fantasy that is not only entertaining but engaging. Reminiscent of Harry Potter, fans of light fantasy will enjoy this series, especially the younger teen audience. Looking forward to book two and seeing where debut author Lynette Noni takes the series. Thoroughly enjoyed it. I keep seeing this one mentioned around the place, but I totally pulled a face at 'the chosen one' *groan* I've had enough of those types of fantasy stories to last a lifetime. It also probably doesn't help that as I'm re-reading Harry Potter at the moment, the idea of something else *like* Harry Potter just seems inferior D: am I a book snob? Not at all Wattle, but it has enough to make it stand apart from the Harry Potter series too. I really enjoyed it and think it'll appeal to a wide range of ages. Give it a go, I think it'll really surprise you. Akarnae sounds so interesting! I love how you mentioned it has shades of HP -it really does! I think the selling point for me, is how it would be easy for non-fantasy readers to follow along with, because although I used to love fantasy, I barely have time for it anymore! I tend to struggle with a lot of fantasy too Geraldine, but Akarnae was so easy to read. So incredibly engaging and fun. I read this one last year and enjoyed it. I like more romance in my YA though, so that let it down for me. Although it had the Harry Potter tropes, I though it was different enough. I am going to read book 2 soon and am hoping there might be a bit more romance. I felt like it was hinted at toward the end of the novel. Great review, Kelly, I am glad you enjoyed it. I do too, but not instant love and I'm enjoying how the it looks to be a Percy Jackson type romance, allowing the character growth first and foremost. I'll be started book two this month as well and really looking forward to picking up the story again. I love Harry Potter (who doesn't right?) and fantasy is my favorite so i might have to check this one out! great review and thanks for sharing! this is actually the first time I have heard about this series! I hadn't heard of it prior either Emily, but so glad I took a chance and read it. It was fun and even sassy in places. I really loved it and can't wait to see what you think of it. Thanks for sharing! I don't really read a lot of fantasy, but I am trying to branch out more! Me too Lauren. I'm not a big fantasy reader, but love magic / boarding school type storylines and this was such a refreshing change from the heavy themed books I've been reading lately. Mine either Joy, most of it goes straight over my head. But this was pretty similar to a cross between Harry Potter and Hex Hall and I really enjoyed it. Really engaging and a quick read as well. I think this is the book that Jeann talked about on her show right?? Anyways, I want to read it! I'm always up for friendship in books! And if one of them develops into romance, I'm not complaining. I used to devour these boarding school stories and of course anything to do with magic is a must-read for me. Too bad that the world building wasn't the best though. It was Nick, good memory! I love boarding school locations, especially with fantasy reads. The world building was good, but I think more so aimed at the younger audience. I still loved in regardless. Should I just assume that this is only going to be published in Australia? BECAUSE POOP. This sounds really good though, and really right up my alley. Especially with the whole entering into a new fantasy world, and not being able to get back home. And yes, it does remind me of Harry Potter! You should be able to get an eCopy on Amazon and Netgalley had book two in the series available to request too. It has a more whimsical vibe that what Harry Potter did, with shades of Wonderland in there too. It was really surprising and made me enjoy it even more.